One of the core features of Web 3.0 would be seamless access of content on mobile devices. As the mobile broadband technology matures, more and more people access the internet from their smartphones and PDAs. 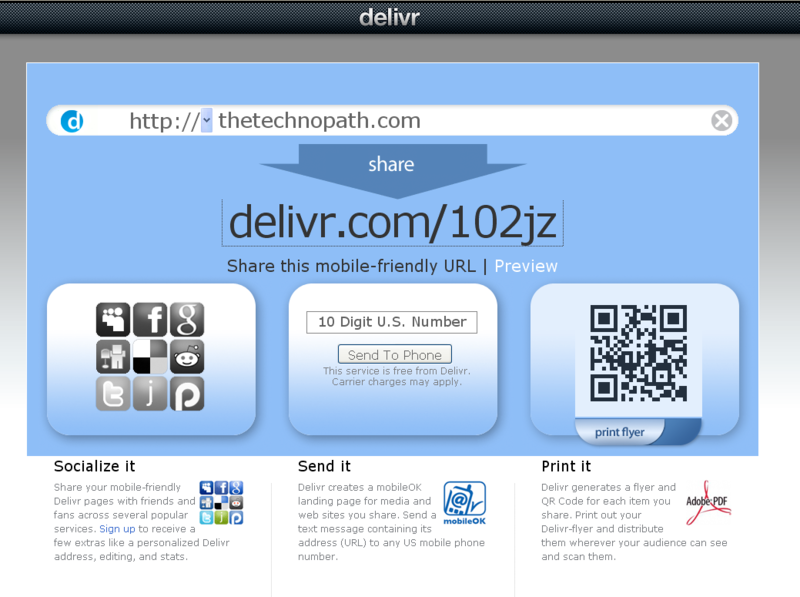 While most services are introducing mobile versions (The Technopath is also available for all mobile devices! just open http://thetechnopath.com/ from any mobile device to get the mobile version) of their services, there is still a huge percentage of the world wide web which isn’t compatible with the mobile devices. While services like TinyURL have made simple content sharing possible, they still don’t format the page to adapt to mobile devices. Delivr however optimizes your URL for mobile devices and adds nice features like content sharing on various social services, sharing directly to mobile (via text message), and even print QR Codes for you. The service has built in support for formatting Websites, Flickr photos, YouTube Videos and Google Maps for mobile viewing using Google Mobile. Just enter a URL, YouTube Video ID, Flickr Username or a Street Address and it will generate a mobile friendly URL. You can share the URL directly on Facebook, MySpace, Twitter, Digg and a number of other services as well as send it in a text message (for free) to a number of international destinations. Delivr currently supports SMS delivery to Australia, Austria, Canada, Germany, Iceland, India, Italy, Japan, Netherlands, Pakistan, Singapore, South Africa, Spain, United Kingdom and US of A. Another cool feature is that you can print and scan QR Codes on your devices that would take you directly to the URL. There are a number of QR Code scanners available for almost every handset platform out there. On the mobile device, the page would automatically be formatted according to the capabilities of your device, though the service is optimized for iPhone and Android for now. Delivr also adds user profiles and a couple of social networking features if you choose to sign up. How ever registration is invite only for now, and you need an invite code to join (comment below of you want one and I’ll email you). Ran 13 queries in 0.165 seconds.